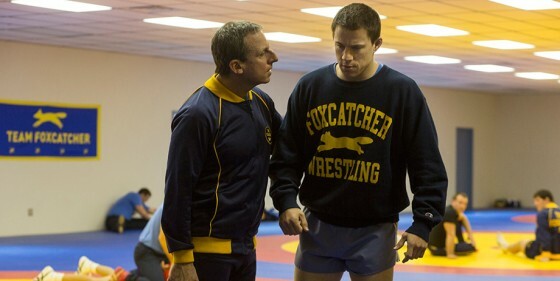 Early on in Foxcatcher, eccentric billionaire John du Pont (Steve Carell) expresses his frustration about the indifference afforded to young men who’ve served their country. That the veteran in question is an Olympic gold-medal winning wrestler (Channing Tatum as Mark Schultz) rather than a military man doesn’t diminish the sense of reactionary patriotism. Set in the late 1980s but attuned to timeless themes like greed, ambition and the embarrassing disparities between physical and economic strength, Bennett Miller’s film suggests a hybrid of Capote and Moneyball: a true-crime thriller that’s also a kind of historical sports movie. Actually, Carell’s du Pont is pretty much Billy Beane as Truman Capote: a jock-at-heart who lacks the physical gifts to pursue a love of wrestling, so styles himself as a flamboyant (and then megalomaniacal) behind-the-scenes strategist. Summoning the sullen and skint Schultz to his sprawling Pennsylvania compound, du Pont soon becomes creepily desirous and possessive, and Miller plays up the wrestlers-as-livestock angle in cleverly staged and composed shots: du Pont arriving at his charge’s chalet in the middle of the night in a tuxedo, pointedly contrasted with the younger man’s resplendent, beefy nakedness; Mark greeting his older brother David (Mark Ruffalo) behind a swinging, saloon-style door that gives the visual impression of a stable. The funereal lighting scheme hints at where the story is going and, as in Capote, the morbidity is laid on a bit thick, but much of what’s here is adroit, from Tatum’s hulking, traced-out introversion (he’s like a polite, Midwestern golem) and Ruffalo’s effortless, tragic gravitas to the script’s neatly enfolded critique of private patronage in amateur athletics. That said, it’s unfortunate that Carell probably stands to gain the most in awards-season terms when his acting is probably the weakest aspect of the film. As long as du Pont is seen in counterpoint to the other characters, he’s a vivid and amusing ghoul—a Montgomery Burns IRL— but Foxcatcher runs so long that Miller is eventually forced to place him front and centre. The much-discussed fake schnozz stands up to scrutiny, but Carell’s showboat acting doesn’t.